Companion Air is primarily concerned with the safety and comfort of all travelers on board their flights and at their facilities. This document describes the conditions and policies under which Companion Air Corporation conducts transportation of pets, people and baggage. Companion Air reserves the right to refuse transportation to any person or pet who may, in Companion Air’s opinion, compromise the safety of their operation or other passengers. All travelers on Companion Air must follow the guidance published on our web site under “travel requirements” including Kennel size and design requirements and current health certificates. While on Companion Air aircraft and on airport property, pets must be leashed and under positive control at all times. Pets and people must not disrupt or interfere in any way with other airport patrons or businesses and any pet wastes must be collected and properly disposed of by the human companion. Any soiling of airport property must be cleaned by the pets companion. Before taking a Companion Air flight with your pet, have your veterinarian examine the animal within 10 days of transport to ensure that it is healthy enough to make the trip and have them issue a health certificate. Ask your veterinarian to provide any required vaccinations or treatments. At Companion Air, we do not recommend the administration of tranquilizers, but of course you should follow the advice of your veterinarian. If you do administer tranquilizers as prescribed by your veterinarian, follow their directions carefully and administer only in the prescribed dosage. Here at Companion Air the safety of our pet friends and our crews is our first concern. Please be sure to arrive with an adequate kennel (or reserve one of ours for a nominal fee). If wheels are installed as part of a kennel, they have to be removable or must be able to be rendered inoperable prior to transport. We don't want kennels rolling around the cabins. If in our judgment your animal poses a danger to other pets or our crews, we reserve the right to refuse transportation. In that case, we will of course refund your fares. Along with your e-ticket, you will receive direction to the local airport (many times this will be your community airport), feeding & watering instructions, and if time permits, identification tags for your pet and one for the kennel. Be sure to bring this information with you to the airport and plan to arrive at least 15 minutes prior to departure time so we can board leisurely and make sure everyone is safe and comfortable. 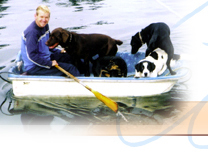 Stress free travel for pets and owners is our mission. If your pet has any special needs, care or considerations, please be sure to write on both the pet and kennel tags. For your safety Companion Air requires that all passengers 18 years of age and older present positive identification for travel. Identification that is acceptable can be either: •	one form of photo ID issued by a federal, state, or local government agency; or •	two forms of non-photo identification, one of which must be issued by a federal, state, or local government agency. All passengers agree to submit to security inspections including scanning by security devices and inspection of all baggage and carry on materials. Passengers also agree to comply with all Government travel requirements. Any passengers without proper identification or those who refuse to cooperate with security screening, who interfering with Companion Air Operations, who failure to maintain positive control of an accompanied pet, or any passenger (pet or people) who causes any disruptions may be denied transportation. Compensation for passengers denied transportation will be limited to a refund of their fares. Companion Air undertakes to use its best efforts to carry passengers and their baggage in a timely manner and as outlined in the passengers travel documents; however, delays, cancellations and variations will occur from time to time. Times listed on ticketing materials or elsewhere are not guaranteed and form no part of our agreement. Companion Air may without notice substitute alternate carriers or aircraft, and may alter routes and stops shown on the ticket in case of necessity. Schedules are subject to change without notice and Companion Air assumes no responsibility for making connections. If a passenger fails to fly one leg of a trip, reservations on following legs may be cancelled unless the traveler reconfirms those following segments. Companion Air travelers, both pets and people must arrive at the designated airport facility not less than 15 minutes before scheduled departure. Failure to arrive with adequate lead-time may result in forfeiture of transportation and passengers may not be eligible for compensation or exchange. See Companion Air’s exchange policies for additional details. Companion Air does not transport dangerous or hazardous materials. Many common and seemingly harmless materials are dangerous aboard aircraft and include flammable liquids, solids and gasses, fireworks, harsh cleaners, solvents and bleaches, CO2 cartridges, spray cans, fuel tanks, gunpowder, pepper spray, firearms, and radioactive materials. Companion Air will refuse to transport any such materials and any other materials classified as hazardous without any responsibility to store or handle refused materials. Carrying such goods aboard an aircraft may be prosecuted as a civil or criminal offense. Companion Air will transport animals unaccompanied under all of the terms for transport described elsewhere in this document. Customers agree to deliver the animal to the airport with proper lead time, in an acceptable travel kennel, in good health, with proper documentation (health certificate), and wearing an identification tag with name and phone numbers for contact. In addition, kennels will be secure and will be tagged with identification listing the pet travelers name, guardian, contact information, feeding and watering instructions (including when the were last fed and watered), and the name and phone number (cell preferred) of the individual meeting the animal. A leash for use should the animal need to be removed from the kennel must also be provided. The transporter of the animal (the person who booked the ticket) agrees to ensure that the animal is met at the arriving airport within 15 minutes of their scheduled arrival. If the animal is not met promptly, Companion Air will arrange for the animal to be transported to a kennel and transporter agrees to be responsible for any transportation, feeding, and kenneling charges incurred. Also, Companion Air reserves the right to seek veterinary care for any animal who appears, in our sole opinion, to be in distress or danger and transporter agrees to be responsible for those emergency veterinary fees. In such cases, Companion Air will attempt to notify the transporter of the need for veterinary care as soon as practical but will not delay emergency treatment. Transporter agrees to hold Companion Air harmless for any damages related to health issues that occur in transit or any treatment that is sought to protect the animal’s health. Tickets are valid for one year after issue for the travel of the original issue. If the traveler needs to change their travel dates, tickets can be exchanged for new tickets under the following guidelines: •	Ticket changes for the same class of service, whereby the traveler notifies Companion Air at least one week prior to travel and where future travel meets the same advance purchase and travel flexibility rules will incur a $25 change fee per ticket. •	Tickets exchanged within one week of travel but at least 24 hours prior to the scheduled travel date and time will incur a $100 change fee per ticket and can then be used to travel in the future under the same fare class, with the same advance purchase and travel flexibility as the original ticket. •	Cancellations within 24 hours will be forfeited except for valid emergencies involving death or serious illness. Companion Air reserves the right to request adequate documentation to support such emergency. Exchanges under this emergency ruling will incur a $100 per ticket fee for the same class of service on a future flight following normal ticketing rules. Companion Air reserves the right to deny transportation to any animal that they deem to be a danger to other pets or people, who appears ill, who is in an inadequate kennel, or who does not meet any of the other conditions for travel. Any species other than domestic dogs, cats, birds, fish and rodents must be approved for travel by Companion Air. All travel must meet the guidance of Title 9, Chapter 1, Part 3 – Department of Agriculture Standards for Transportation of Animals. Kennels must be of adequate size and securely hold the pet. Size guidelines can be obtained from the USDA. Generally, the animal should have adequate room to stand and turn around in the kennel. Birds must be in a similar secure and adequate container with a cover (for darkness). Dogs and cats must travel in their own individual kennel. Rodents, rabbits and other such animals may travel jointly as outline by the USDA. All animals and containers must have ID tags that show the animal’s name, guardian information, phone numbers and any other special care instructions. All domestic dogs and cats must have a leash provided. While health certificates are required for all animal travelers and Companion Air uses its best efforts to provide safe, comfortable travel for all pets and people, the health of the animal is solely the transporters responsibility and the transporter agrees to hold Companion Air harmless for any health related complications that may arise during travel. Companion Air will provide a controlled environment for pet travelers from when the animal is accepted for transport until it arrives at its scheduled destination. The transporter assumes responsibility for the pet’s safety at the airports prior to boarding and upon arrival. If the pet is accompanied, the companion traveler is responsible for ensuring the pet is leashed and controlled at all times while on airport property or on the Companion Air aircraft. If unaccompanied, the transporter will maintain control of the pet while on airport property and will deliver the pet to Companion Air in an adequate and secure kennel with proper identification and an adequate leash. Companion Air offers transportation to pets, people and cargo subject to a limitation of liability equal to $2,500 per ticketed pet, accompanied or unaccompanied unless a higher value (for checked baggage) is declared in advance and additional charges are paid. The passenger accompanies all baggage on Companion Air flights and therefore, passengers are responsible for the safety and security of their own carry-on baggage. In cases where passenger baggage is damaged by willful neglect of Companion Air, liability for such baggage is limited to $1500 per ticketed human passenger. Companion Air is not responsible for loss or damage that involves electronic equipment, photographic equipment, jewelry, cash, computer equipment, fragile items, perishable articles or other similar valuable items. Companion Air’s liability for death or injury to human passengers is limited to $10,000 per passenger, which is consistent with the Warsaw Convention limitations. Additional protection can usually be obtained from private insurance companies; the Warsaw Convention does not limit such coverage. Companion Air is a smoke-free airline. Use of tobacco products is prohibited on all Companion Air flights and at all Companion Air facilities. Companion Air reserves the right to change these Terms of Transport from time to time by posting the new Terms of Transport to their web site.